How Far Has Oscar Evolved...really?? How Far Has Oscar Evolved…really?? This is Pete Hammond’s article from Deadline.com that I find particularly poignant and wanted to share. The 1963 Oscar ceremony marked a significant milestone in the history of the Academy Awards—and for African-American actors. Sidney Poitier took the best actor prize for Lilies Of The Field, an “Amen” moment, to quote the best picture nominee’s famous song, if ever there was one. Until Poitier, only Hattie McDaniel, who won best supporting actress in 1939 for Gone With The Wind, held the distinction for any African-American actor, and it would take another two decades after Poitier’s seminal win for it to happen again (when An Officer And A Gentleman’s Louis Gossett Jr. won a supporting statuette in 1982). After presenter Anne Bancroft opened the envelope and excitedly read Poitier’s name, he bounded to the stage as the orchestra played “Amen” and he famously called it, “a long journey to this moment.” Poitier said he didn’t expect to win, and many predicted Tom Jones star Albert Finney would take it. (Neither Finney nor the other nominated actors—Paul Newman (Hud), Richard Harris (This Sporting Life) and Rex Harrison (Cleopatra)—were in attendance, but that was not uncommon in Oscar’s earlier days.) After all, Tom Jones would prove to be the evening’s big winner, taking best picture and three other Oscars. 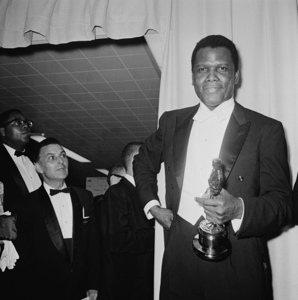 It is particularly appropriate to recall Poitier’s win this year, as 2013 was significant for the number of acclaimed films revolving around the black experience. But how far have we come since Poitier’s historic win? Three black acting nominees, Chiwetel Ejiofor and Lupita Nyong’o (12 Years A Slave) and Barkhad Abdi (Captain Phillips) are in the running, as well as a black director, Steve McQueen, and screenwriter, John Ridley (also for 12 Years A Slave). But other black-themed films, such as Lee Daniels’ The Butler, 42, Fruitvale Station and Mandela: Long Walk To Freedom were ignored (with the exception of U2’s song nomination for the latter). Progress has been made, but it’s clear the Academy still has room for improvement. The “long journey” still continues, but on the occasion of the 50th anniversary of his memorable Oscar triumph and on his 87th birthday, attention should be paid to Poitier and the torch he carried alone for so long.